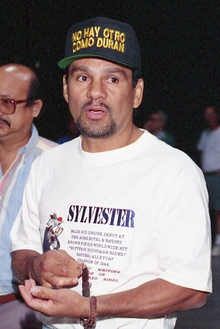 Roberto DurÃ¡n Samaniego (born June 16, 1951) is a Panamanian former professional boxer who competed from 1968 to 2001. He is a four-weight world champion, having held titles at lightweight, welterweight, light middleweight, and middleweight; as well as reigns as the undisputed and lineal lightweight champion, and the lineal welterweight champion. In 2002, DurÃ¡n was voted by The Ring magazine as the fifth greatest fighter of the last 80 years, and is currently the 26th greatest pound for pound boxer of all time in Boxrec's ranking, while boxing historian Bert Sugar rated him as the eighth greatest fighter of all time.